The territory of today historical - geographical Macedonia in the long far away past was settled by various tribes and nations. Between the oldest tribes and nations that lived on the Macedonian territory were: Brigians (Phrygians), Illyrians, Thracians, Edonians (Migdonians, Bysalts, Sythinians) Painonians and Pelagonians. All of them assimilated each other. By the end of the 9th century BC, all the territory of Macedonia without the area of Skopje and Kumanovo was settled by ancient Macedonian tribes. Ancient Macedonians lived on the south, to the Pindus mountain, and the valleys of the rivers Vardar (Axios), Bistrica (Halijakmon), Crna (Erigon), Struma (Strimon) and the coast of the Aegean sea. North of Macedonia there was located Painonia, south Thessaly region, west Epirus and east Thrace. Macedonia was known as Upper and Lower Macedonia. The name MACEDONIA comes from the two ancient Macedonian words macos = big, large and don = land, which both together have meaning, big (large) land. The ancient Macedonians were the largest population of this region. In the part of Upper Macedonia there were the areas Orestida (river Bistrica and the Kostur Lake), Pelagonija, Elimea (the middle part of the river Bistrica), Timphaja and Paravaja. In the part of Lower Macedonia were the areas Pyeria (the region of Thermaikos Gulf), Beothia (the central part of the rivers Bistrica and Moglenica), Eordaia, Alpomia, Migdonia, Krestonia and Bysaltia (north of Chalkidiki). 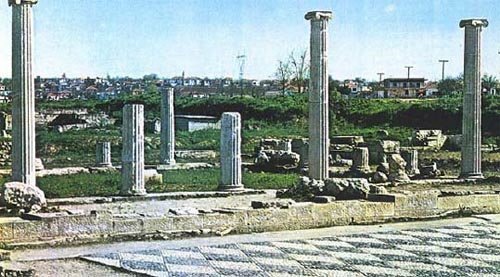 "The first ancient Macedonian capital - Ayga)"
Macedonia had an excellent climate, valleys by the big rivers and lakes and sea access. There were also mine treasures (gold, silver and iron). The ancient Macedonians were a nation with their own language, culture, different by other by their appearance, clothes, weapons with symbols, different from the other ancient nations of the Balkans. The warrior who still didn't killed any one had to wear rope in the middle of his body. The ancient Macedonians had extremely beautiful decorated temples. 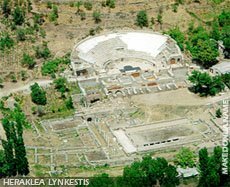 The newest archeological researches made, proved that the ancient Macedonians were a nation with large knowledge in the architecture. "The 16 pointed sun is a symbol of the Macedonians"
The earliest files and documents are full of legends. The same is the case with the documents of their origin. First, the ancient Macedonian were not Greeks and were not even related to them. But, the history as a science knows that at the end of the 9th century BC, almost all territory of Macedonia was settled by ancient Macedonian tribes. In the period of the 8th century BC, there was a fall of the pre-historic society. And after that period Macedonia was settled by more and more Macedonian tribes, with their tribe leaders. The leaders of the tribes among themselves were independent. But in periods of war those tribes were making contracts and alliances between themselves. Sometimes the Ancient Macedonians have fought between themselves for territory. In the period of the 8th century BC, the Ancient Macedonians still had primitive way of agriculture. But the Macedonian aristocrats, have started to use slaves. All tribe problems were solved in the peoples assembly. The members of this assembly were all men that were able to use weapon. The ancient Macedonians were an arrogant nation. Every spring the Ancient Macedonians were starting war with the neighboring tribes. Main targets were Illyria and the coastal Greek (Hellenistic) colonies (by this fact no one can say that the ancient Macedonians were a Greek people). And as the time was passing through, the tribes especially in Lower Macedonia improved the sense of being one nation. Result of this was the forming of the Ancient Macedonian State in the year of 729 BC, by Perdica 1st. The tribe called Argeady took the authority of Down Macedonia and created the first state of the ancient Macedonians. By Herodotus (ancient Greek historical), from Argon Orestida, escaped the three brother Guan, Aerop and Perdica. All of them went to Upper Macedonia in the town of Lebaya. The state of the Argeady took authority over larger region of Macedonia. The first ancient Macedonian king was Perdica 1st (729-678 BC). For capital of this ancient state he choose the town of Ayga (Kutleš). But this town was located highly in the mountains and had no merchant connection. But the king Arhelaius 1st (413-399 BC) solved this problem. 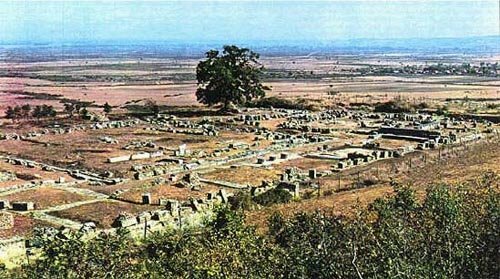 He moved the capital from Ayga (Kutleš, Vergina), to new city with excellent geographical location, Pella, in the middle of the huge filed in the Salonica region. Pella was one of the biggest cities in its period. This king built kings fortress, which was designed by Greek architects and soon the city Pella, attracted a lot of Greek cultural workers. "Pella (also known as Postol)"
"During the battle, a Macedonian soldier found the wounded Darius, who was shouting for help on Greek, but poor him nobody understood what was he speaking. But the soldier not understanding him was forced to look for a translator." "If two people, that do not understand themselves what they speak, it would be spoken that they speak different languages." Maxx Fosmer, one of the best researchers of the Balkan languages, confirmed that the ancient Macedonian is different than the ancient Greek. Also a lot of Greek philosophers and teachers came in Pella, such as Aristotle, teacher of Alexander the Great. Demostenes (384/385-322), the well-known orator of Athens, in his political speeches - "Philippics" defined the Macedonians as a separate nation and called them "Barbarians who spoke language incomprehensible for the Hellenes". The king Philip 2nd of Macedonia (359-336 BC) found a new town, known as Heraklea Lynkestis, near Bitola and improved Philippi, near Kavala, because of it's gold mines. 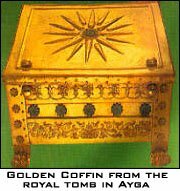 Prove of the ancient Macedonian culture is the gold coffin with the 16 pointed Macedonian sun, discovered at the archeological site Vergina, near Solun (Salonica) in 1977. There are kept more important things from the culture of the ancient Macedonians. Thanks to the archeological researches have been discovered plenty ancient towns, like: Ayga, Pella, Dion, Heraklea and others. One of the most important monuments are the necropolis Trebeništa, near Ohrid and Sindos (known also as Tekelievo), near Solun (Salonica), the royal Tombs at Ayga (Vergina-Kutleš). 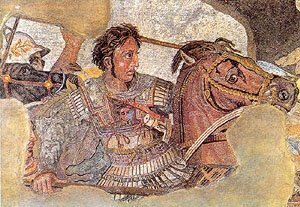 "Alexander The Great (336-323 BC)"
His son, Alexander the Great (336-323 BC), enlarged the Macedonian state and improved into an empire, on 3 continents Europe, Asia and Africa. Egypt, Persia, India, Greece - were the names that he ate for breakfast. He ruined Thebes, the great power in ancient Greece, killed the persian king Daruis, defeated Porus the Indian, at Punjab, where Indian state was created centuries ago. But after his death in 323 BC the empire vanished. The kingdom was ruled by Lyzzimachus, Seleuk Nikator, Philip 3rd Arrydeius and many others. Later in the 2nd century (167 BC), the Macedonian state failed under Roman rule. As a last and unsuccessful ruler was Perseius son of Philip 5th, was taken to Rome and murdered. The ancient Macedonians were a religious people. Ancient Macedonians believed in artificial sources of power, had tradition and believed in gods. Main god has been the god of the sky, Dios. The king Arhelaius 1st built, the famous temple in the town of Dion, and here in this town he organized Olympic games. Goddess of protection has been Giga and there has been a cult to the Greek god of enjoying, wine and the production, Dionysus.